A toast is a ritual in which a drink is taken as an expression of honor or goodwill. The term may be applied to the person or thing so honored, the drink taken, or the verbal expression accompanying the drink. I think toasting is such a lovely tradition. There is a bit of etiquette and technique involved in giving and participating in a toast. There is always something to celebrate...right? Be Eloquent, Whimsical, and Witty. Make sure that the toast you are delivering is appropriate to the intended audience and occasion. Be Simple. Keep your toast short and to the point. Avoid use of big words. The simplest words often sound the most sincere. Be Yourself. Give it from the heart. Be Brief. Avoid more than just a few sentences. Don't use the toast as a soapbox. Be Prepared. A good toast is a speech in miniature. Any good orator will tell you, it takes far more work to craft a short message, than a long speech. It takes practice to sound spontaneous. It's not a bad idea to have two or three short toasts memorized for when the opportunity presents itself. If you're quoting a well known work, know the context of the lines so as not to leave people reading something else in, between them. Be Done. End on a positive note. Clearly define the end by saying "Cheers! ", asking your audience to "Raise your glass," or some other accepted gesture. Never drink a toast or stand, when it's being offered to you. However, you should always stand up and respond to the toast, even if this means just thanking the host for the gesture. 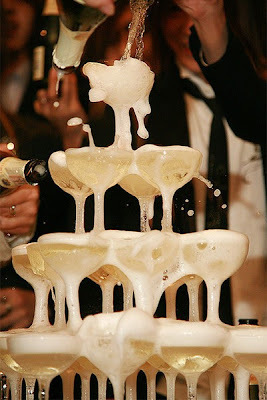 Never should a toast be offered to the guest of honor until the host has had the opportunity to do so. If it appears that the host has no intention of offering a toast, it would be polite to quietly request the host's indulgence to do so yourself. You should always stand when offering a toast unless it is a small informal group. Standing can help you to get the attention of the group and quiet them down. It is best not to signal for quiet by rapping on a glass. You could easily end up with nothing to toast with. It is not a good idea to push someone to make a toast who would otherwise prefer not to. You might hear a toast that you would just as soon not hear. If there is a large group of people, it is not mandatory to clink your glasses when the toast is made. Instead, just raise your glass and take a sip. If it is a small group of people, you should always look the person in the eyes when you clink their glass.